Search and adopt a Pug near you. The Pug is of Chinese origin dating back to the pre-Christian era. They were prized possessions of the Emperors of China and lived in luxury, at times even guarded by soldiers. Dutch traders brought the Pugs from the east to Holland and England. The more refined Pug that we know today can be credited to the English. This happy little dog was enjoyed by many Monarchs of Europe and to this day is a favorite with discerning people all over the world. The Pug is a small breed with a wrinkly, short muzzled face, and curled tail. Their puppies are often called puglets. The breed has a fine, glossy coat that comes in a variety of colors, with a compact square body and well-developed muscle. There are two different types of a Pug’s ears, “button” and “rose”, button being the standard. Strong legs, straight of moderate length, set well under. The shoulders are moderately laid back. The lower teeth normally protrude further then their upper in an under-bite. They have been described as multum in parvo ("much in little"), referring to the Pug's remarkable personality despite its small size. Known in Ancient China as "Lo-Sze", they may have contributed to both the modern Pekinese and King Charles Spaniel. The fine, glossy coats can be fawn, apricot, silver or black. The tail normally curls tightly over the hip. Different coat types will shed to varying degrees, but they all shed quite a bit year round. Fawns have both an undercoat and an overcoat, and are the most notorious for shedding. Regular grooming can keep the shedding down. Strong willed, but rarely aggressive, the Pug is suitable for families with or without children. The breed is tolerant of children, and sturdy enough to play with them. Otherwise they can be quiet and docile, but also vivacious and teasing, depending on their mood. They can make good watchdogs, they are alert, but not overly yappy. The Pug arrived in the United States some time during the nineteenth century (the American Kennel Club recognized the breed in 1885) and was soon making its way into the family home and show ring. In 1981 the Pug Dhandys Favorite Woodchuck won the Westminster Kennel Club show in the United States, being the only Pug to have won since the show began in 1877. The World Champion (Best in Show) at the 2004 World Dog Show held in Rio de Janeiro, Brazil was a Pug, Double D Cinoblu's Masterp. As they have many wrinkles or folds in their faces, owners normally take special care to clean inside the creases, as irritation and infection can result from improper care. 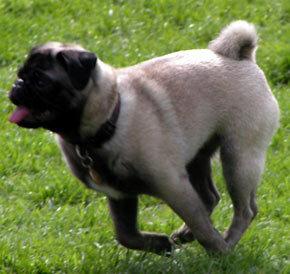 The Pug, like other short-snouted breeds, has an elongated palate. When excited, they are prone to a "reverse sneeze" where the dog will quickly, gasp and snort. The veterinary name for this is Pharyngeal Gag Reflex. Fluid or debris getting caught under the palate and irritating the throat or limiting breathing causes this. "Reverse sneezing" episodes are not harmful to the Pug, and can usually be resolved by lifting the dog's head and blowing a short, strong breath into the dog's nose which can clear the fluid and or debris from the palate. This breed has been featured on television and film, including Frank the Pug in Men in Black films, its sequel, and its animated series. Other films that have featured the Pug breed include The Adventures of Milo and Otis, Disney's Pocahontas, 12 Rounds and the 2006 film Marie Antoinette. On television, they have appeared in numerous shows such as The King of Queens, Spin City, Legend of the Dragon, The West Wing and the British soap opera Eastenders. Pugs have also appeared in a variety of fictional print media, including the hypnotic Petula in the Molly Moon series, Lady Bertram's Pug in Mansfield Park and in the book "Pugs: God's Little Weirdo’s", a spin off from the Sheldon web comic. They are also featured in several handheld video game devices.